I have used my trusted Porter Cable 557 plate joiner for almost a decade now. It's about time to bring in a few challengers and see if the old guard is still competitive in today's market. 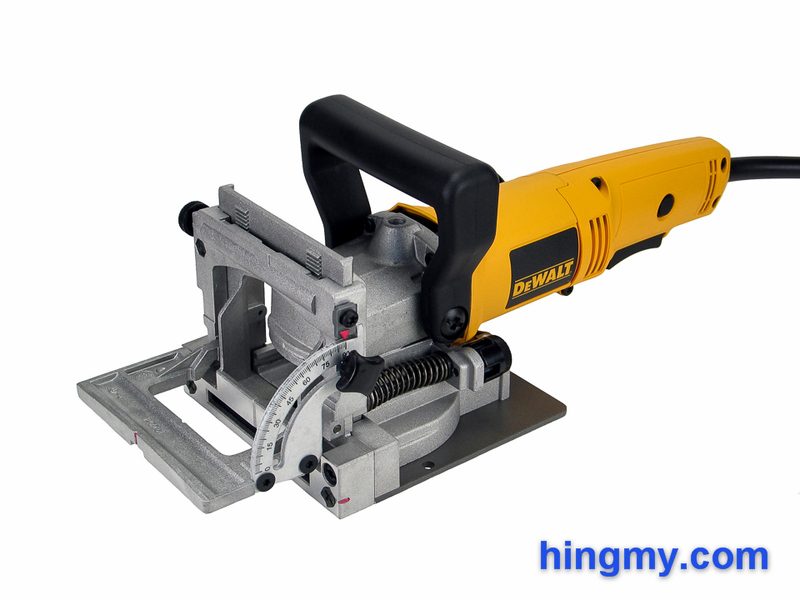 Enter DW682K, a surprisingly affordable plate joiner from DeWalt. Let's take look, if the DW682K can challenge the reigning champ. 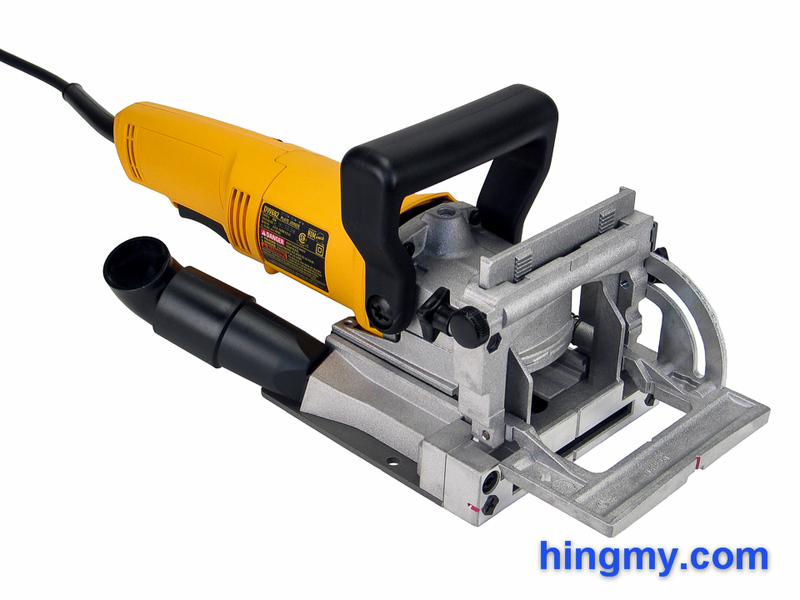 The DW682K is a heavy duty plate joiner intended for production use. Every part of the tool has been engineered to perform in such an environment. The fence assembly and gear housing are cast from magnesium. Only the motor cover and rear grip are made out of plastic. The chassis of the DW682K is unmistakably that of a grinder. The metal gearbox in the nose of the motor unit is a dead giveaway. The yellow handle hides a 6.5 amp motor. That's plenty of power to propel the DW682K's 4 inch blade through even the densest hardwoods at 10,000 rpm. A single speed trigger with a lock-on button activates the motor. The DW682K is well engineered and built to last. Plunging while holding the fence steady takes some care. The motor fan is badly designed. One of its exhaust ports vents directly upward and into the face of the operator. If there is any airborne dust in your shop, the DW682K is going to make sure you'll get a face full of it. Like most plate joiners, the DW682K has two parts. The fence assembly, which positions the blade for a cut, and the motor unit, which powers the blade. The motor unit moves forward and backward along groves in the fence unit. A cut is made by pushing the motor unit into fence thereby exposing the blade at the throat of the fence. The vertical adjustment mechanism of the fence uses two racks and a single pinion that runs the entire width of the fence. The upshot of this design is that both sides of the fence will move in unison ensuring that the fence stays parallel to the cutter at all times. On our review model blade runout was less than 0.001". Any new DW682K owner should check the fence for runout, since there is no way of adjusting it. Turning the knob attached to the pinion moves the fence up and down. A gauge built into the left side of the fence shows the distance from the fence to the top of the blade. The gauge can be zeroed using two screws. The thumb screw on the right locks the fence into place. The screw is functional, but cannot be called comfortable. The angle adjustment mechanism is located on the left side of the fence. A thumb screw locks the fence into place anywhere along its 90 degree range. Like the thumb screw used to lock the vertical adjustment mechanism, this thumb screw is a little too small too be called well designed. 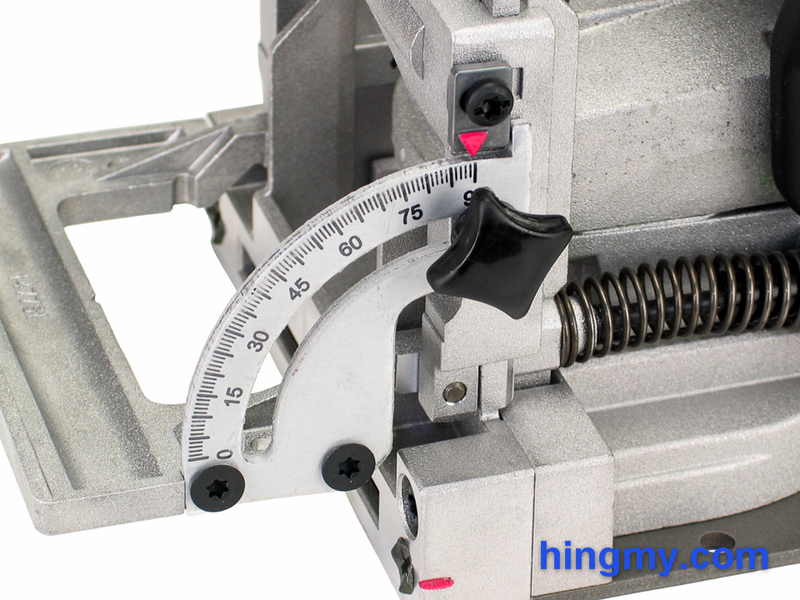 The angle gauge engraved into the corner bracket of the mechanism is accurate to plus/minus 1/4 of a degree. The whole mechanism can be zeroed out to ensure dead on cuts at the 90 degree setting. As a system the fence works well. Positioning the fence accurately is both quick and intuitive. Built entirely out of magnesium all parts of the fence are going stay perfectly aligned for the life of the tool. This high level of quality plays a big part in the DW682K's superb cutting performance in our tests. Two metal pins, one on each side of the fence, grab the work piece and stabilize the fence. The pins have sharp edges and can mar soft wood. If they are not needed or wanted, they retract below the face of the fence. This design works well to stabilize the fence, but is clearly inferior to the grit cover faceplates used by some of the competition. The pins cannot be used for indexing. 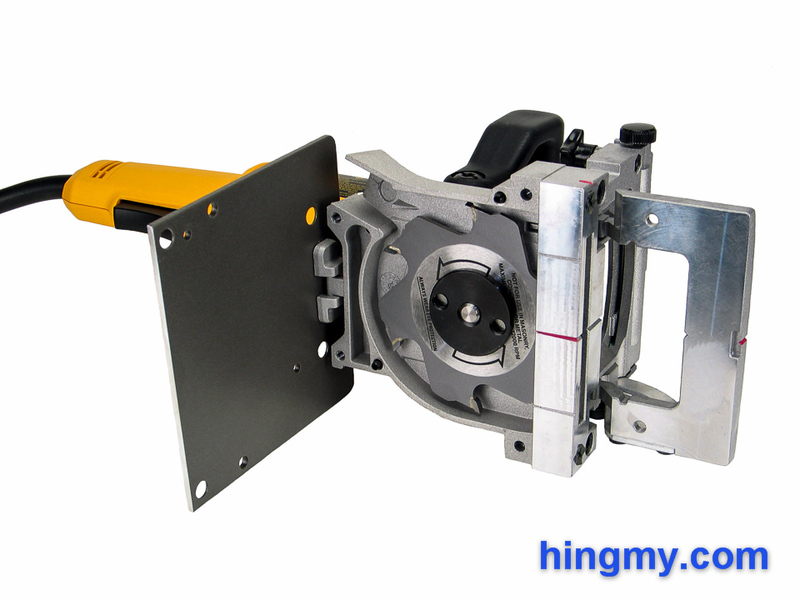 The motor unit of the plate joiner moves in and out along two slots cut into the base plate. A fairly stiff spring retracts the blade after each plunge. On our review model there is no measureable drift in any unwanted direction during a cut. Oddly the front handle is attached to the motor unit and not the fence assembly, like it is on many other plate joiners. Having both hands on the handles leaves nothing to keep the fence in place other than the pressure created by the plunge. I instinctively chose not to use the front handle and placed my hand on the horizontal part of the fence. Accuracy does not suffer, but cutting a few dozen slots like this is not comfortable. The competition offers a better handle design. High volume users should take note. The plunge depth is set with a dial on the left side of the tool. Choosing one of four settings sets the tool's cutting depth to the exact depth required for the chosen biscuit type. A fine adjustment screw in the front face of the fence ensures every cut is dead on. Blade changes are very cumbersome on the DW682K. First the four screw securing the base plate have to be removed. Using your own Torx head screwdriver saves you from having to deal with the undersized key included in the kit. Once the screws are out the base plate pivots out of the way. Why the plate does not simply come off, I do not know. The hinge merely ensure that the plate is close enough to the action to get in the way. The blade is removed like one would remove the wheel of a grinder. A spindle lock located at the top of the gear housing locks the arbor in place. The lock nut securing the blade on the arbor is removed with a special wrench included in the kit. All that would not be so bad, if DeWalt had paid attention to the details. The spindle lock button is too small to press comfortably, and the blade wrench is too small and entirely too square for the task. All together changing the blade on this plate joiner will take about 15 minutes to complete, and you'll be angry after having done it. Thankfully the blade only has to be changed when it gets dull, which is not a frequent occurrence. The kit version of the tool comes with a standard vacuum formed DeWalt case. The case is water and impact resistant. Plastic dividers secure the tool inside without the possibility of it shifting during transportation. There is even a compartment to store the blade wrench and key. The DW682K scores full marks for accuracy. Every biscuit slot we cut in our tests was aligned perfectly parallel with the fence and the edge of the work piece. This plate joiner leaves no tearout to clean up, and the walls of the slots are smooth. The slots are properly dimensioned for the four different biscuit sizes the DW682K supports. Getting the tool ready for a cut takes little time. The height and angle adjustment mechanisms are both easy and quick to use. The plunge mechanism, on the other hand, takes some getting used to. When holding the tool by the handles the operator needs to pay close attention to the fence. Plunging in any direction other than straight into the work piece can move the fence out of alignment. It is by no means difficult to cut a perfect slot with the DW682K, but it does not take much to cut a bad one. The DW682K is not one of those tools that makes it hard for the user to produce a bad result. Holding the plate joiner by the fence with one hand is a different technique one can use, but it does not solve the problem. Anyone who cuts biscuit slots by the hundreds is better served by a tool that is easier to use. Low frequency user, on the other hand, only need to pay attention for a few seconds to get perfect results from the DW682K. The DW682K is a very loud tool. It shares this trait with grinders, which use the same gearbox design. Hearing protection is mandatory. The DW682K manages dust well, but needs help from a dust collector to be useable in a production environment. Thanks to the totally enclosed blade and the covered nature of the cuts the tool makes, virtually all dust get ejected through the dust port on the right of the base plate. When making cuts in soft wood, which produces larger shavings, the port tends to clog after 3-4 cuts. A screwdriver is all you'll need to clear any obstruction, but doing so regularly gets tedious very quickly. Plunging slowly, which produces finer dust, prevents this issue almost entirely. The included dust collection bag works well. It collects all airborne dust. The only dust you'll see is what little falls out of the throat of the tool. Unfortunately the bag fills up very quickly, which exacerbates the clogging problem of the dust port. Often times you'll only get to complete a couple of slots before the dust port needs to be cleaned. Attaching a shop vac to the DW682K solves all problems. The vacuum removes all dust right at the source making this plate joiner a viable tool in a dustless shop. The dust port no longer clogs either. If you are cutting slots in bulk, using a dust collector increases your productivity. 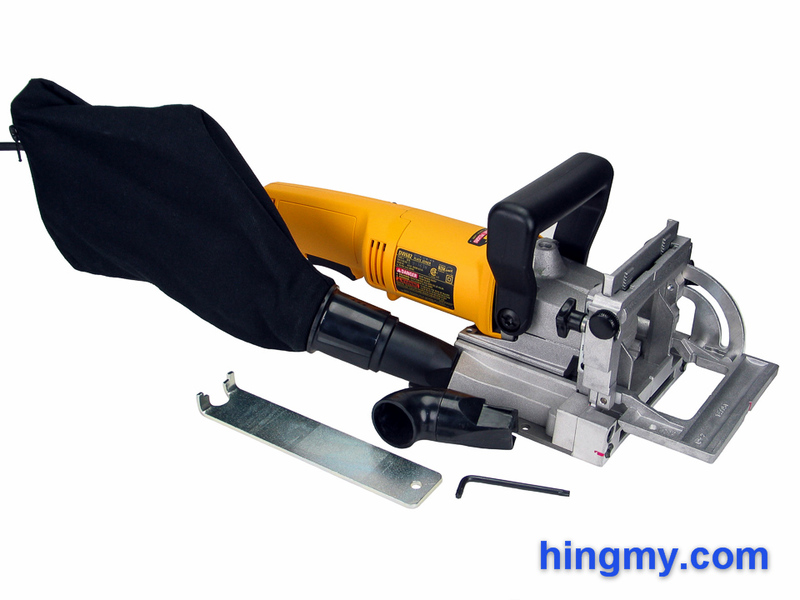 The DW682K is a capable plate joiner. A durable and accurate fence unit and powerful motor combine to produce perfectly sized and aligned biscuit slots at a production pace. The dust port has a tendency to clog when the tool is used without a dust collector. The fence design is susceptible to manufacturing errors, but DeWalt has a good track record building this tool properly. The front handle is attached to motor unit instead of the fence. A good result requires good form from the user. This makes the DW682K error prone in a high volume environment where operator fatigue is a factor. In the hands of a woodworker, who only has a few slot to cut at a time, the DW682K is a fully capable plate joiner that produces results like the best of them.